The Gross Reservoir Expansion Project, which is set to start in late 2018, will change the dynamic of a favorite Front Range escape—so get there ASAP…and check back for new trails after the water rises. Just a few miles outside of Boulder, Colorado, Gross Reservoir has provided miles of shoreline for running, hiking, camping and paddling since it was created with the construction of a dam back in 1954. But Denver Water plans to expand the reservoir by raising the dam an additional 131 feet to increase water storage capacity and system reliability—a project set to begin in late 2018. Large infrastructure projects such as this one require balancing the needs of a growing population with the conservation of natural areas that bring people here in the first place. Meaning that the reservoir will change and lose some favorite trails, but the agency does have plans to reroute existing paths. Here’s how you can enjoy the place during the process. This high mountain lake spans 440 acres and is surrounded by primitive campsites and many miles of singletrack trails. The little-trafficked South Boulder Creek Inlet Trail, for example, has some great terrain for hikers and trail runners along the southern shore of the reservoir. Passing through trees and ending up on the sandy shore, it’s a great choice on a hot day. It’s also going to disappear under the new reservoir footprint, enjoy this trail while you can. While the Forsythe Canyon trailhead will not be affected, the pleasant Forsythe Falls found along this trail will be inundated once Gross Reservoir is expanded, so it’s another spot to check out before it’s gone. Construction will take place in various phases, with Denver Water currently working on an interim recreation plan that will go into effect as soon as 2019. Early work would limit public access to the south side of the reservoir. Under this plan, access to trails located around the inlet, boat ramp and south side of the dam would no longer be open to the public for the duration of the seven-year construction timeline. Paddlers will still be able to access the water, however—though the current boat ramp will likely shift locations to the North Shore of Gross Reservoir. 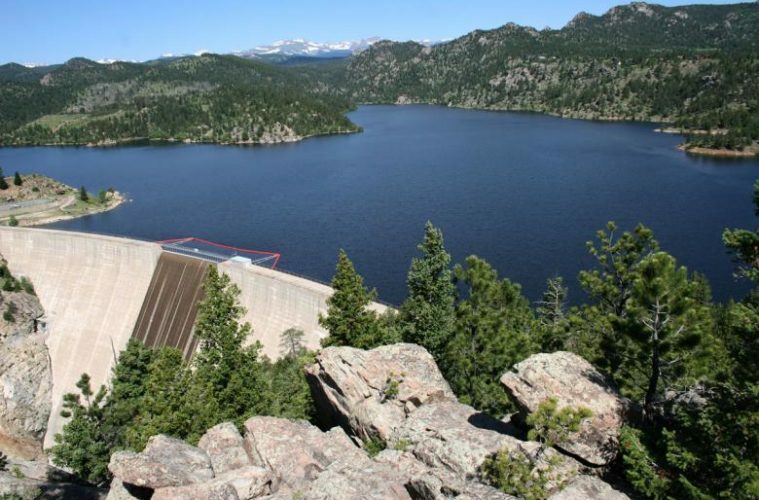 With the expansion of the reservoir, which is anticipated to increase water supply to the Front Range by 77,000 acre-feet, the water level will rise an additional 124 feet. This would put about 424 acres of surrounding land under the new reservoir footprint. Denver Water plans on relocating trails affected above the new high-water line. An additional three miles of shoreline will also be added, providing new trails, views and vistas by the project’s completion in 2025.